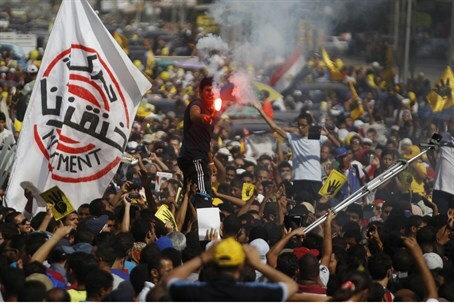 Three people killed in Cairo as supporters of ousted Islamist President protest for a second straight day. Three people were killed in Cairo on Friday as supporters of ousted Islamist President Mohammed Morsi held scattered protests for a second straight day, according to AFP. At another protest in Giza, demonstrators fired birdshot, set off fireworks and tried to block a road. One protester was killed when police moved in to disperse the group, a statement from the Interior Ministry, which is in charge of the police said, adding that the man was armed. In a third incident, protesters torched a public bus in a Cairo suburb after forcing the driver and passengers out. Police arrested at least 14 protesters at the events, the security officials told AFP. Morsi's Muslim Brotherhood movement was listed as a terrorist group after his overthrow last July 3 and many of its leaders, including Morsi himself, have been jailed. The Muslim Brotherhood’s supreme guide, Mohammed Badie, was sentenced to death on June 19 but the country’s top religious authority rejected the death sentence. He has been asked by a court to reconsider.